How do you promote your stream on Instagram? Our complete guide runs through who is currently doing it well, how you should be promoting yourself and some ideas to use on Instagram and Instagram Stories. If you a Twitch streamer who loves Instagram and is already active, then it makes complete sense for you to focus your time on it. Who is doing it well already? Before we talk about what you could be doing, let’s look at what others are doing. The below list is not for you to compare and copy, but to highlight what is already working well for popular streamers. Never let their popularity paralyse your creativity because you feel like you can never be bigger. All streamers started off with no viewers, they all spent years working hard to find their niche, their audience and ultimately their success. 1 – Lirik is using Instagram for mostly cat pictures, these photos are high-quality and follow a consistent ‘theme’. 2 – Ninja is one of the largest streamers on Instagram, and although he mostly posts short gaming clips from his streamers (Fortnite and more Fortnite), he also throws in some personality posts with his dog (awhhhh) and daily activities outside of his stream. Showing off your IRL life is important for viewers getting to know who you are behind the screen, and allows viewers to understand the different things you enjoy. 3 – Some streamers are also competitive players and travel the world playing in tournaments, in Allie’s case this means she can utilise it and get some stunning photographs from different locations! 4 – Full of personality with portrait photos and selfies, Pokemane’s Instagram channel is a colourful place that ties in with her on-stream nature. Pokemane also uses her Instagram as a place where she can promote her clothing merchandise! So, how do you stand out? Do you do something different? Something similar but better? There are always opportunities and gaps. Are you showing cool or funny video clips from your Stream? Taking amazing pictures of your setup? How about trying to film your mouse/keyboard while you play a game? (yeah I’m not sure how you’d do that either…). But get creative! There are a million things you could be taking a photo of, or filming… you just need to think outside the box, and tie it into what you normally do on your stream! Storytelling is the what content creators are all about, so finding ways to tell ‘stories’ through your Instagram posts is worth considering. Don’t neglect writing long descriptions on each post if appropriate! 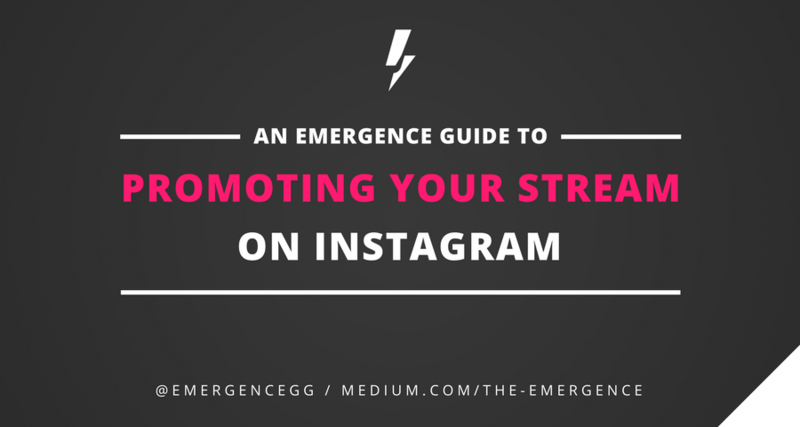 Instagram is all about hashtags — worth trying a few new ones! (and not always the popular ones too). Be sure to look into hashtags for the specific games that you stream too! Be yourself. Yes, you can fake a character or a personality but it will never truly be you and never be authentic. Being yourself has an added advantage in that it is a niche itself. Nobody is you, nobody can do the things you do, the way you do them, and nobody can think of things the way you do. Be yourself. Read, watch, listen to everything that you are interested in. In this case, watch a ridiculous amount of Twitch streamers to understand what ‘niche’ they are working on, see which streamers are standing out on Twitter, on YouTube and in press. Critically think while you watch then, what made that funny? What is their branding like? What makes them stand out from the other people on Twitch? How do they run their social media accounts? Where are the gaps? Is there a streamer who speed-runs Diabo? Is there a creator who paints while they play Sims? Is there a hilarious streamer playing Battlefront 1? There are always going to be gaps, and there are always going to be ways to stand out by doing something better. There are thousands of PUBG streamers coming top 50 every game, but do you win nearly every game? That is a niche in itself. You can only find out if all your ideas, your personality and your research was right. Once you’ve found your niche, you’ve got to keep it super consistent. There is no point in finding the perfect place for you on Twitch, and then the next day doing something completely different. You’ll find ways to naturally expand once you’ve ‘won’ your area, so for now focus on that and try every way to stand out. I was talking to upcoming streamer ThisIsFoobar about his two passions, for him they were Destiny 2 and Golf. I’m sure there are thousands of Destiny players and potential viewers who love golf… so he should focus on making the best of that content and utilising the right hashtags, engaging with the right people and being consistent with it. Then all it takes is hard work and patience. Although it’s nothing to do with Instagram, there is a streamer called Fruitbats who is an expert on… you guessed it, fruit bats! Viewers come into his stream and talk about bats with him! This is simply a case of being nice and friendly to those who make content like you do. For example, you find another streamer doing the same thing as you — they are not competition — they are a potential friend who may be up for collaborating and playing games with you! In ThisIsFoobar’s case, he should follow all the Xbox Destiny 2 players on Instagram and engage with them. Watch what they are doing, do it better or do it differently! And if he doesn’t find any Xbox Destiny players on Instagram… Sounds like there is space for one! We can’t talk about Instagram without asking the question, are you using Instagram stories? With over 300 million daily active users, Instagram Stories are a popular way for people to show off the less edited, more behind-the-scenes photos and videos throughout their day. Pictures are either taken from within the app or imported from your camera roll. They last 24 hours before disappearing so consider how they can be used for limited time events (such as going live pictures/videos). What are your other passions? TV shows? Films? Music? Dancing? Cooking? Share it with your viewers! Don’t forget to use the Story Highlight feature, where they’ll live forever on your profile! Group these into separate ‘themes’. Instagram has opened a vertical video channel where anybody with an Instagram account can publish videos up to 10 minutes long (large creators can post up to 60 minutes). Videos are currently not able to be recorded live, and I can imagine IGTV videos to be a mix between the polished Instagram news feed and the less-polished Instagram Stories. Although vertical video is not everybody’s favourite thing — I’m intrigued to see how users creatively use it to create videos in a mobile-first format.